After a federal agency failed to launch a rescue effort last month, at least 54 juvenile steelhead trout died in dry pools in the upper Ventura River near the $9-million Robles fish ladder, which was ordered built by the U.S. government to help save the endangered fish from extinction. This comes after a rescue attempt earlier this summer relocated a dozen downstream migrating fish back upstream. 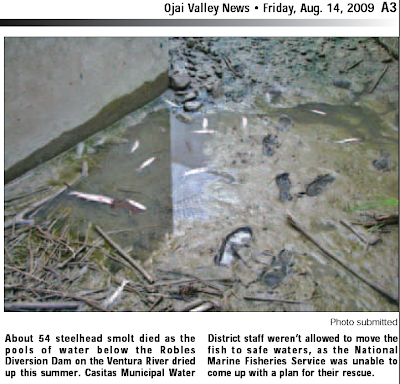 The May news article stated that a federal permit would be completed within a month, which would have provided the opportunity to rescue the 54 fish that perished in July.